Description: Buttforde owns an old romanic church with origin in the 1st half of the 13th centuty, built with worked granite blocks. The characteristic element in the richly decorated interior is a three piling jube dating from the same time. On this jube the organ was placed. It was built in 1681 by Joachim Richborn. To get enough height for the instrument, the flat beam ceiling was increased partially. Joachim Richborn (died 1684), derived from Hamburg and possibly was an apprentice of Friedrich Stellwagen. 1676 he was involved in the repairing of the organ in the St. Maria Magdalena church in Hamburg. Also he delivered work in Moegeltondern (Danmark). Beside the organ in Buttforde the organs in Berdum (1677) and Tönning (1681/1682) are known as his work. 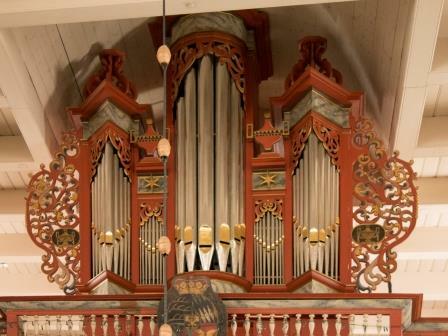 In 1684 he started the building of the organ in the St.Nikolai church in Elmshorn but died during the work. Also that organ probalbly was finished by Arp Schnitger. After the death of Richborn in 1684 the short but very successful era of Arp Schnitger startet in East Friesland. The original wing doors were substituted by embellishments in 1803. The pipes of the trumpet rank were displaced within during a repair by Alfred Führer in 1949. All other ranks are preserved in original state. The wooden parts of the organ, especcially the case lately have been in a very bad shape and had to be restorated urgently. The windchests have been leaky, so the high stops nearly couldn´t be used any more. The mouths of the pipes had been cracked by inadequate tuning, the corpuses dented. Due to the reduction of wind pressure pipes had been shortened and didn´t had the original length. This lead to a reduced volume of the sound. Also the housing and other wooden parts urgendly needed restoration. The prospect lead pipes hat a tin sheeting that peeled away. It is notable that the intonation with its vocal sound of the Principal was still preserved and there were nearly no languid nicks, which is nearly without precedent for organs of the Schnitger period. The instrument being operational for so long a time withoud significant interference shows the high quality of Richborns work. The Restoration in 2011/12 was done by Hendrik Ahrend. Ahrend stabilised the housing und rekonstructed three new bellows, which can be operated manually by wire rope. The pedal keyboard was reconstructed and covering of the manual keyboard, which had been extended by Führer, has been set back to its original length. During the reconstruction of the tracker action the roller board was set back to its original place. The piped were gently restorated and the lost trumpet was reconstructed following the original dimensions which had been documented by Führer in 1947. The prospect piped got a new tin lining and with that their original brightness. Finally the wind pressure weighted in 1947 and meantone temperament were restored.